Welcome to the Simple Homestead Blog Hop #202! The Simple Homestead Blog Hop #202 runs every Thursday morning to Sunday evening, so spread the word and spread the love. Share your best material and check out someone else’s best material, too (maybe leave a comment letting them know you found them here at the hop!). Be sure to follow your hosts to let them know you’re here, as well! Personally, I love to use blog hops as a source of pinning material for Pinterest. I find a few posts that I really love and pin away! Interested in checking out our past hops? How about these! 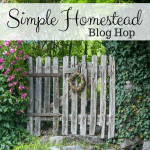 Simple Homestead Blog Hop 198, 199, 200, 201 and 194 are all great options! Previous Post: « New to Vegetable Gardening? Tips for Persevering from my Own Failures!